This 928-room hotel is a complete destination with everything guests want for fun, with mouth-watering restaurants and a 60,000 square-foot casino. Stay entertained with great shows, ranging from concerts to magic shows to comedy acts and more. The rooms offer mountain views along with the amenities that welcome guests for a wonderful stay. 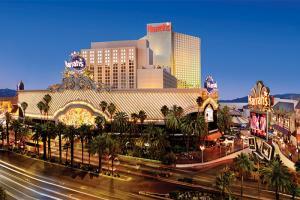 Harrah's Steak House, Joy Luck Noodle Bar, Hash House A Go Go, Carvings Buffet, Ichiban - Sushi.